Canadian Mineral Processors | Flowsheets Metallurgical Consulting Inc. 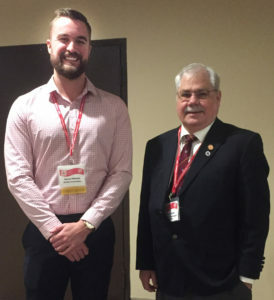 The 49th national meeting of the CMP took place in Ottawa this week. A total of 537 delegates attended from 11 countries. The plenary was entitled “The Need to Innovate: Celebrate the Past…Look to the Future”. Day 1 was spent on comminution; day 2 on flotation; and day 3 on gold and some innovations. In my view this was the strongest technical programme that I have seen at the CMP in five years. 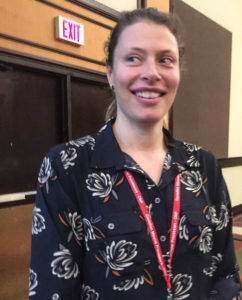 An interesting paper on reducing the dilution of spodumene concentrate with iron silicates by magnetic separation was presented by Dr. Charlotte Gibson, of SGS Canada. She is shown in the photo below. 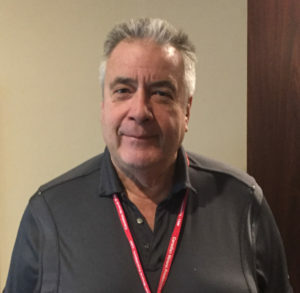 A development in vibrating screen design at operations scale was reported by Ed Wipf, of EdRockMan IV, in which particularly the problem of classifying SAG mill discharge at a high tonnage has become a key problem because of wear and temporal overload situations. The new design is called Two-Mass Screens, and has rearranged the screen into a double-deck driven by a different mechanism. The campaign life of the screen has been considerably extended as a result of this different design. He is shown in the photo below. A remarkable project on improving the flow of mill feed through a storage bin by testing and modelling the physical properties of the rock was presented by Tracy Holmes of Jenike and Johnson. The case study was at the Kittila Mine in northern Finland, where ratholing, bridging and freezing limit the free flow of ore to the mill. The modelling work led to a redesign of the bin with successful outcomes. Tracy is shown in the photo below. 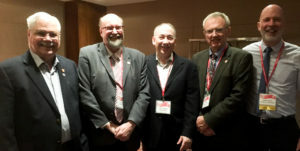 A reception was held on Tuesday evening for the organising committee of the recent IMPC meeting at Quebec City. The conference was very successful. In the photo below are some of the organising committee Norm Lotter, Jim Finch, Nathan Stubina, Jan Nesset and Don le Roux. An interesting and worthwhile paper on the sustainable stabilisation of arsenic was presented by Gabriel Garcia Curiel, of Dundee Sustainable Technologies. Traditionally arsenic has been stabilised by a hydrometallurgical process, however in this work a different approach using vitrification and then set in glass. In this form there is no release of arsenic to the environment. GoldCorp’s Simon Hille presented an update on their Peñasquito project in Mexico, where a brownfield expansion is adding a pyrite float to the final tailings of the main lead and zinc circuit to recover gold in a concentrate that undergoes an extractive process to refine the gold to bullion. These days, more and more of this refractory hosting of gold is developing, and we expect to see flotation becoming a more significant unit recovery process for this metal. The Joint Venture between Flowsheets Metallurgical Consulting Inc and Starkey and Associates continues. Below is a photo of Dr. Norm Lotter of Flowsheets and Spencer Reeves of Starkey and Associates at the conference. 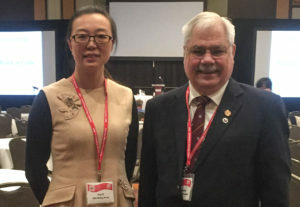 Dr Jing Li, Chief Mineralogist at Zijin Mining, Xiamen, China, also attended the conference. Below is a photo of her with Norm. The organising committee of the CMP and contributing authors are to be congratulated on a fine performance this year. The balance of academic and operational research and projects was just right, and the overall quality of papers was excellent. It’s in point of fact a great and helpful piece of info. I am satisfied that you simply shared this useful info with us. Please keep us informed like this. Thanks for sharing. some really wondrous work on behalf of the owner of this website , perfectly outstanding articles. I enjoy you because of each of your effort on this blog. Gloria take interest in getting into investigations and it’s really easy to see why. All of us notice all regarding the compelling form you make very important techniques through your website and as well inspire contribution from website visitors on the issue then our princess has been being taught a lot. Take pleasure in the remaining portion of the year. You’re doing a pretty cool job. I and my pals were actually reading through the great secrets located on your site and then suddenly came up with an awful feeling I had not expressed respect to the site owner for those secrets. Those young men are already consequently very interested to read through all of them and have in effect quite simply been tapping into them. Appreciate your getting indeed thoughtful and then for picking out variety of fantastic guides millions of individuals are really desirous to understand about. My very own honest regret for not saying thanks to you sooner. I have to express my respect for your kind-heartedness supporting those people that really need assistance with this important field. Your special dedication to passing the message around has been extremely good and have truly helped others like me to arrive at their desired goals. Your amazing insightful key points indicates a great deal a person like me and extremely more to my mates. Thank you; from each one of us. you are my intake, I own few blogs and very sporadically run out from to post : (.